It is a common knowledge that deficiency in iron can cause anemia. In fact, it is one of the leading causes of anemia in the world. There's another type of iron deficiency that does not necessarily cause anemia but can lead to a variety of symptoms including fatigue, skin problems, sleep disorders, and depression. Latest information about this 'hidden' iron deficiency. What is this new type of iron deficiency that leads to sleep disorders and depression? Below are case studies on the new type of iron deficiency, which was conducted in Japan. Patient A had been suffering by depression. A doctor had given a certain medicine. After one year, the symptoms had improved dramatically. Patient B had been suffering from insomnia. By taking a certain medicine, she was able to sleep comfortably. Based on the above case studies, both patients share two common things: they both have "ferritin deficiency". Ferritin is a protein found in the liver, intestines, and spleen. It is one of the main places in the body where iron is stored. Sometimes, it is called "body iron stores". That is, the medicine that was actually given to these two patients was simply "iron". Therefore, if you are suffering from fatigue that is accompanied by depression, sleep disorders, and dry or irritated skin, then there's likelihood that you have ferritin deficiency. But how can our body be deficient from ferritin? Iron helps in many functions of the body like cell growth. While iron is absorbed into the body from foods, it will also be stored in ferritin in various places of the body. The ferritin proteins will release the stored iron every time the body needs it. The body will produce rough or dry skin cells. 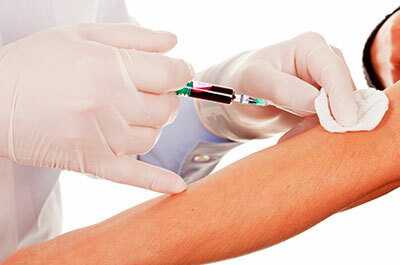 The number of immune cells that protect the body from pathogens or other foreign substances will be decreased. Neurotransmitters such as dopamine and serotonin, which are indispensable to the inner workings of the brain, will be in short supply. In the two case studies mentioned previously, the two patients were not aware that they have iron deficiency but were plagued by symptoms such as sleep disorders and depression. All of these happened because of a deficiency in ferritin. Surprisingly, the two patients who have sleep disorder and depression did not show any symptoms of anemia. In fact, their hemoglobin levels were normal. Hemoglobin is essential as its primary function is to transport oxygen to the body tissues. Without iron, hemoglobin molecules will still be there but it wouldn't be able to bind and transport oxygen, making it useless. Therefore, a normal hemoglobin level does not always mean that your blood is not low in iron. In fact, a low hemoglobin level reflects a more advanced stage of iron deficiency. One of the best ways to detect early stages of iron deficiency is through a ferritin level blood test. This is an important thing to know since you can simply increase your ferritin levels or iron stores by increasing the amount of iron-rich foods in your diet. Do not wait until your hemoglobin levels drop! 1. Check the back of your lower eyelid. 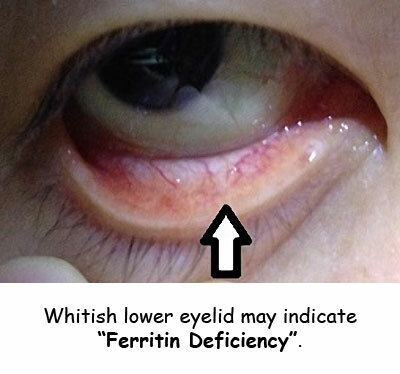 If it is whitish, you may have ferritin deficiency. 2. Check if you easily get tired, irritated, and always feels depressed. If these symptoms persist, there is likelihood that you have ferritin deficiency. Increase Your Body's Absorption of Iron with Vitamin C! To prevent ferritin deficiency, first and foremost, make sure that you're taking enough iron in your diet. However, there is one surprising catch about iron intake. Vegetables such as spinach and seaweeds contain a compound called "oxalic acid". Although they are considered rich in iron (non-heme iron), it is less absorbable by the body compared to other iron-rich foods (heme iron) like chicken and beef livers, red meat, and fish or shellfish. In other words, our body can absorb more iron from animal foods than plant foods. Luckily, there's a way that can help our body absorb more iron from iron-rich vegetables especially if you are on a vegan diet—and that is by taking vitamin C! The secret lies with vitamin C's ability to convert iron into a more readily absorbable form. Studies show that the iron absorption rate of the body can be twice as much when consuming vitamin C.
Indeed, raw vegetables are also rich in vitamin C, but cooking them can significantly reduce their vitamin C contents. Therefore, it is recommended that you combine vitamin C-rich fruits like lemon juice whenever you eat iron-rich vegetables like spinach. 1. "Using Cast Iron Cookware Helps Blood (Anemia) and Iron Deficiency"